Baroness Thatcher of Kesteven, LG, OM, FRS, 1925-2013, died at the Ritz Hotel in London, on Monday, 8 April, aged 87. Britain’s first Female Prime Minister was granted a Ceremonial Funeral with military honours, which was held at St Paul's Cathedral London, on Wednesday 17 April. Leading mourners other than her immediate family unusually included Her Majesty the Queen and HRH Prince Philip. The last time that they had attended the funeral of a Prime Minister was in 1965 in honour of Sir Winston Churchill. Lady Thatcher's coffin, draped in a Union Jack, after being transported to St Pauls on a horse-drawn gun-carriage, was carried into the Cathedral by a bearer party, comprising of representatives of the Services who took part in the Falklands Conflict of 1982. Margaret Hilda Thatcher (nee Roberts), was born in Grantham, Lincolnshire, on 13 October 1925. Her father was a grocer (and Mayor of Grantham) and Napoleon’s apocryphal quote ‘England is a Nation of Shopkeepers’ seems quite inappropriate in her case. She read chemistry at Somerville College, Oxfordbut then read for the Bar before being elected as Conservative Member of Parliament for Finchley in 1959. Margaret Thatcher had a slow progress through Parliament before becoming Education Secretary in 1970. In 1975 she stood successfully against former Prime Minister Edward Heath as Leader of the Conservative Party and then became Prime Minister in 1979. History suggests that she inherited a Country in decline and turmoil and that she was not universally popular but the invasion of South Georgia and then the Falkland Islands by Argentina brought her a new prominence and popularity as she refused to allow what was Britain’s most southerly inhabited outpost to be ‘stolen’. This decision transformed Ascension Island overnight. As the forward operating base for the Task Force aircraft traffic at Wideawake Airfield increased from an average of 24.4 aircraft per month in the 12 months prior to April 1982 to 3,607 aircraft in April 1982 alone. It is said that for a short period of time Wideawake Airfield was the busiest airfield in the world bar none. It was also from Ascension that the RAF’s audacious Vulcan Black Buck Raids were launched. Post-1982, Ascension became part of the critical air bridge between the United Kingdom and the Falkland Islands, supplying troops and supplies to the Falkland Islandsgarrison, initially using RAF Tristar aircraft as the main workhorses but in recent years these have been replaced with chartered commercial airliners. The RAF continues to maintain a small contingent at Ascension to support these flights. 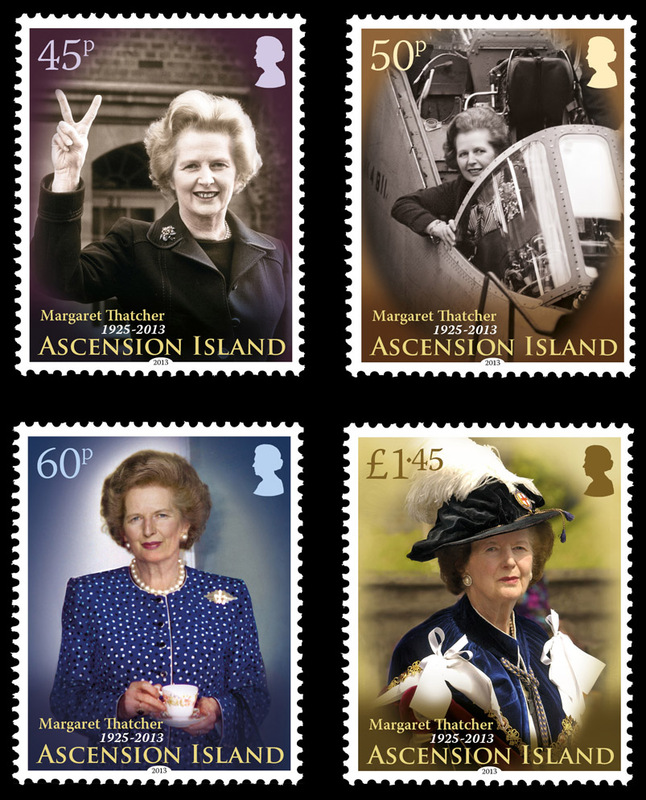 In 1992, Lady Thatcher stopped at Ascension Island (60p) as part of her visit to the Falkland Islands on the 10thAnniversary of Liberation. 45p - As the Conservative party leader Margaret Thatcher makes a 'victory' sign outside her home in Chelsea, London in November 1976. 50p - As Prime Minister Margaret Thatcher inspects a Sea Harrier aircraft, during a visit to the British Aerospace factory at Dunsfold, Surrey, 18th December 1982. 60p - As Prime Minister, Margaret Thatcher is photographed at The Residency on Ascension Island en-route to the Falkland Islandsin June 1992. Margaret Thatcher also took the time to sign a number of First Day Covers released to mark the 10th Anniversary of the Liberation of the Falklands. £1.45 - Baroness Thatcher was appointed a Lady of the Garter in 1995. The Most Noble Order of the Garter was founded by King Edward III of England in 1348 and is now the oldest and highest order of chivalry in the British honours system. FDC - A portrait of Margaret Thatcher, Prime Minister (1990). 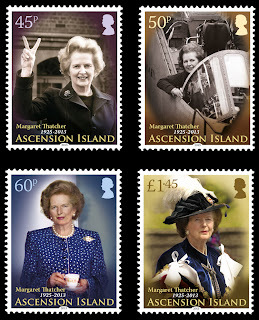 The stamps will be released on 14th June, Falkland IslandsLiberation Day.